Hook bins, Skip Bins, Garden Bags and Rubbish Removals. All your rubbish removal needs sorted. Fast. Easy. Reliable. Cheap. Brisbane, Logan & Ipswich. Check our areas. Hook bin or Skip bin? Ring now for friendly advice and prices. Garden Bags. Skip bins. Hook Bins. Rubbish Removal. We have your junk covered. Which rubbish removal service suits you? Garden Bag, Skip bin. Hook bin or Rubbish Removal? *Green waste & cardboard, light dry clean rubbish. *Hardfill Concrete, soil, gravel, rocks. * The driver will give you a hand to fill the bin and take it away immediately. Prices include 30 mins drivers time plus the volume of rubbish. 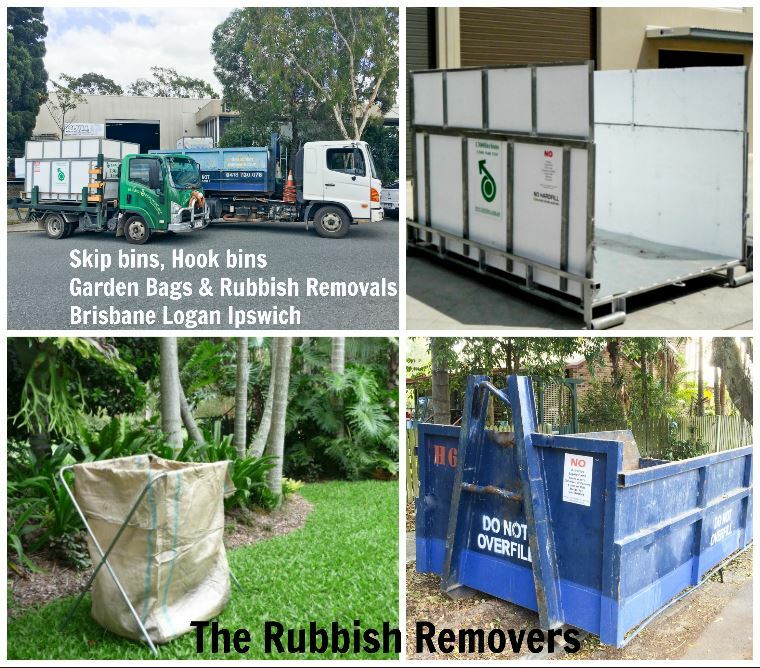 Welcome to The Rubbish Removers Brisbane, Logan & Ipswich “We do rubbish well” Whether you need to hire a skip bin, organise a rubbish removal or have a regular garden bag exchange we can provide a reliable friendly service. We are a family owned and operated Rubbish Removal company and we aim to provide an easy, affordable way to clean up your home, yard, business or work site. Tell us what and where the rubbish is and we will offer you the cheap and easy solution to remove all your junk! General house hold junk, furniture, white goods. Tidy up the garage, shed or under the house. Office, retail and business clean ups and old stock removal. Rubbish removals are perfect for when you do not have enough time or energy to take the rubbish away or space is limited to leave a skip bin onsite. We can organise a complete clean up or give you a hand (with a strong body to go with the hand) to load the rubbish and take it away. Pricing – Up to 6 cubic m is based on the volume of rubbish and the price includes 30 mins of time. If you have an extra big job we will give you a quote so you know what you are up for. A Garden Bag service is perfect for the regular removal of all leafy green waste like palm fronds, grass clippings, hedge trimmings weeds and pruning’s. You can also put cardboard and light dry, clean waste into the garden bag. FREE set up. We exchange the bag monthly or 2nd monthly. Minimum of 6 bags. We give you a fridge calander and send email reminders so you know when we are returning to exchange your bag. Got heavy rubbish (bricks, tiles, trees etc) or massive volumes of rubbish? Try our Hook bins. Hook bins are sized 4 – 18 cubic m with a huge 4 tonne of weight allowance. Fill out your details & we are done.